Lanterns and flags adorn many a Buddhist home, apart from the multi-coloured jets and illuminations during Vesak, a thrice -blessed festival. 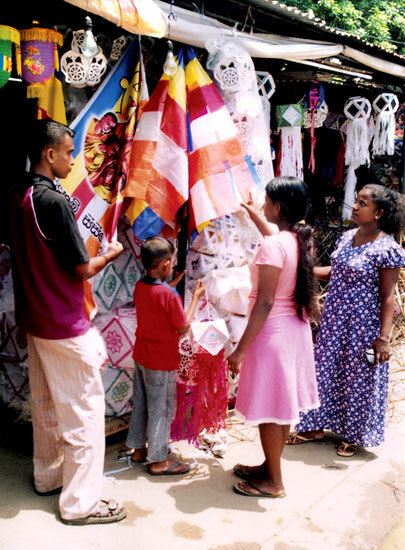 Here two youngsters, their mother and another customer make their pick at a stall in Katubedda, Moratuwa. The biggest loan defaulters in Sri Lanka are the rich millionaires in Colombo and not the poor peasants in rural areas. The BoC does not ask farmers to mortgage their land as collateral to obtain agricultural loans and there are other ways we ensure the security of loans, said BoC Chairman Dr. Gamini Wickramasinghe. CEO Maxis Communications Berhard Malaysia Sandip Das told a group of journalists from Sri Lanka in Malaysia last week that Sri Lanka still has a lot more potential to expand in the sphere of telecommunications and he was confident that the biggest impact will be felt in the mobile arm of SLT where Maxis has the experience and the expertise.